What kind of crash have we? Search traffic for "market crash" soared as markets worked on their daily 5% trim. Contrarians will take pleasure in this, but it doesn't ease the pain of the losses. News volume also increased sharply, another sign of saturation and capitulation. 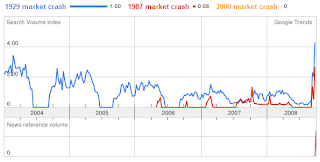 The "1929 market crash" is the doom-and-gloom of choice for readers, followed closely by 1987. The 2000 meltdown didn't register amongst search topics. In numeric terms we have exceeded the losses of 1987; the 36% loss in the S&P from high to low in 1987 was outdone by the 42% loss (and counting) we are now experiencing. 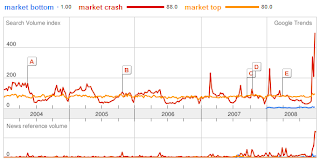 Next on the crash watch is the 50% loss witnessed from 2000 to 2002, chief difference to this is the current loss will have occurred in about half the time it took the tech bubble to collapse. What of 1929? The first step in 1929 saw a 48% loss for the Dow in 2 months (looking good so far) which was followed by a counter rally of 48% which took 5 months to complete. It was after this counter rally that the real pain set in. In terms of decline structure what we have is very similar to the first phase meltdown in 1929; the precipitous drop without relief. Not even the September 2001 decline came close as the S&P then gave up 23% from August highs to September lows (albeit on the background of a year long bear market), but even this 'milder' decline was followed by a 24% rally. The real worry will be what happens after we relief rally (based on simple historic comparisons we could come back 42% from here). The 1929 story is well covered with its 83% discount, but the much neglected 2001-2002 drop sheared off 35% from 2001 high, or 18% from the September low. 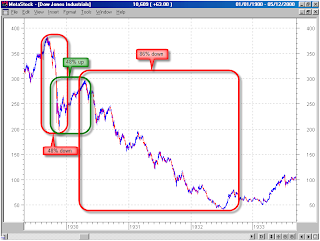 In addition, the latter part of 2002 and early 2003 was spent meandering in a scrappy, soul-searching trading range. Should we put ourselves in stasis until 2010? Can one profit, or at least protect yourself in the current environment? Unlike 1929, there is no shortage of inverse index funds and ETFs to invest in. How future restrictions (if any) on short selling affects these remains to be seen, but when the relief bounce plays out it will be time to take a look at some of these trading vehicles as insurance against a decline in your stock portfolio, or as a straight profit trade. Key moving averages (like the 50-day and 200-day MAs) are excellent lines in the sand to buy/sell these instruments. 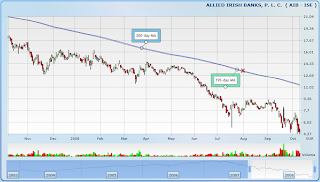 If your favourite stock breaks on volume through its 200-day MA the chances are its confirming a new bull trend. If your favourite stock retreats off its 200-day MA, then it may be time to sell and/or load up on an inverse ETF/fund (especially if the broader market confirms). 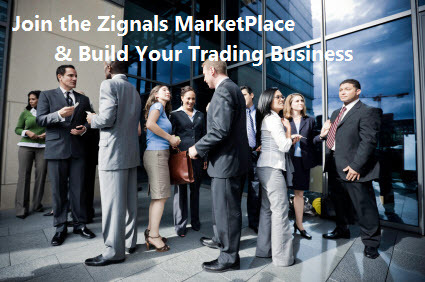 You can use Zignals Alerts to track how your stocks perform relative to moving averages. 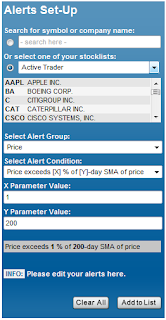 In this case you can be alerted if a stock exceeds its 200-day MA by 1%, but you can set a second alert for a break of a 195-day MA; effectively alerting for stocks approaching their 200-day MA. If you wanted to take it a step further you can create an Advanced Alert with a volume filter (200% of 60-day SMA of Volume is a good one to try) combined with the 200-day MA break to confirm such a bullish move in a stock.